Stephen King (website) is an author who literally doesn’t need an introduction. If you haven’t heard of Stephen King yet, you’ve been living under the proverbial rock all this time. And chances are you’ve still watched some of the movies they made based on his books, like ‘IT” or ‘The Shining”, to name just a few. He is maybe the best known American author of thriller/horror/fantasy genres. His over 50 books have been sold over 350 million copies, and many of them have been turned into popular movies and TV series. Many readers are aware that the author also writes under the pseudonym Richard Bachman. 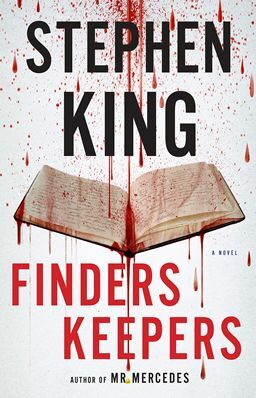 His latest novel is Finders Keepers, published in 2015, the second book in the Mr. Mercedes trilogy. Born in 1947 in Portland, Maine, he was living with his mom and brother from a very young age, after his parents divorced. At the age of 11 the family moved to Durham, Maine, where he went to grammar school. He graduated from from Lisbon Falls High School in 1966, following which he went to the University of Maine at Orono, where he contributed to a weekly column called The Maine Campus. In 1970 he graduated with a BA in English, and in 1971 he married Tabitha King. The same year he found a teaching position at Hampden Academy, while in his spare time he continued to write short stories which he would sell to men’s magazines. His first novel, Carrie was published in 1974 Doubleday & Co., a book which was soon turned into a movie with Sissy Spacek. Soon other books followed, including The Shining (also made into a movie starring Jack Nicholson) and The Stand. He also wrote several short stories that were also published. In 1981 he published another book for the movies, Cujo (I still remember this movie, it gave me nightmares for a long time back in the day). Except for his standalone novels and short stories, Stephen King also wrote the popular Dark Tower series, with the first book published in 1982, for a total of 7 books. In the meantime the author kept writing books, many of which again were translated to powerful movies, such as Christine, and The Dead Zone (starring Christopher Walken). Firestarter featured Drew Barrymore and It, which was made into a mini series. At the moment the author is still going strong with new books being published every year. Here is all the list of the Stephen King books in order, including the standalone novels, series and short stories published to date.